Editor's note: Click here for full coverage of the rescue at the Chilean mine where 33 miners were trapped following an August 5 collapse. [Updated at 3:13 a.m. ET, 4:13 a.m. Chile time] Taiwan announces plans to invite rescued Chile miners for visit. [Updated at 1:10 a.m. ET, 2:10 a.m. Chile time] Chilean President Sebastian Pinera plans to visit the miners at Copiapo Regional Hospital Thursday morning. [Updated at 12:22 a.m. Thursday ET, 1:22 a.m. Chile time] Check out this gallery, which contains video of all of the 33 miner rescues. [Updated at 11:59 p.m. Wednesday ET, 12:59 a.m. Thursday Chile time] Earlier today, before rescue worker Manuel Gonzalez talked to Chilean President Sebastian Pinera about mine safety shortly after Gonzalez was the last person to leave the mine, Pinera criticized the mining operation. Pinera said the mine, which collapsed August 5, "never should have functioned as it was functioning; it had a long history of violations." He added, "I want to announce to the Chilean workers and the employers that we are going to make a new pact in which the life, dignity and protection of workers will be the focus of government concern." Representatives of the mine owner, the San Esteban Mining Co., have said previously they will collaborate fully with Chilean authorities and the Chilean Congress in their inquiries about what went wrong at the mine. [Updated at 11:39 p.m. Wednesday ET, 12:39 a.m. Thursday Chile time] After Chilean President Sebastian Pinera greeted and congratulated rescue worker Manuel Gonzalez - the last person to be lifted from the mine - the rescuer told the president something very similar to what the final rescued miner, Luis Urzua, told Pinera earlier tonight. "Mr. President, I hope this never happens again. I hope Chilean mining will be different; I hope things will be done correctly in [mining]," Gonzalez said, according to a translation from Spanish to English. Pinera responded that he expects to someday announce new regulations to help protect Chile's workers, not only in mining, but also in other industries. [Updated at 11:33 p.m. Wednesday ET, 12:33 a.m. Thursday Chile time] And now the rescue operation is done. The capsule has carried rescue worker Manuel Gonzalez – the last person to be lifted from the miners’ refuge – to the surface. He is cheered enthusiastically by fellow rescue workers. 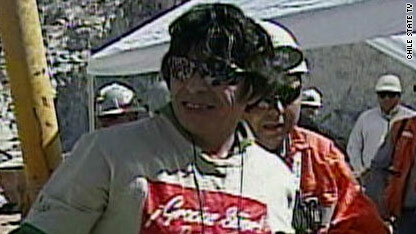 Gonzalez returns about 25 hours after he went into the refuge to help the 33 miners get back to the surface. [Updated at 11:22 p.m. Wednesday ET, 12:22 a.m. Thursday Chile time] Rescue worker Manuel Gonzalez - the last person still in the mine - waves and bows to a camera inside the former refuge of the 33 miners before entering the capsule that will take him to the surface. The capsule is being lifted now, and he'll be at the surface within minutes. [Updated at 11:17 p.m. Wednesday ET, 12:17 a.m. Thursday Chile time] While communicating with people on the surface as he waits for the capsule in the miners' underground refuge, rescue worker Manuel Gonzalez - the last person in the mine - talks about how tough it must have been for the miners to be trapped for more than two months. "I've been away from home for a week, and I can't imagine what it'd be like to [be away] for 70 days," he said, according to a translation from Spanish to English. [Updated at 11:15 p.m. Wednesday ET, 12:15 a.m. Thursday Chile time] Rescue worker Manuel Gonzalez, the last person in the miners' refuge, is speaking with people on the surface as he waits for the capsule that will take him home. [Updated at 11:06 p.m. Wednesday ET, 12:06 a.m. Thursday Chile time] A fifth rescuer has been lifted to the surface, leaving just one rescuer - the last person still in the miners' refuge 23,000 feet underground - to be brought back up. [Updated at 10:55 p.m. ET, 11:55 p.m. Chile time] People all around the rescue area were in a festive mood in the minutes after the last miner was lifted to the surface. At "Camp Hope" - the area near the rescue site where miners' relatives have been holding vigil for weeks - about 50 to 60 of government police officers were marching down the mine's access road, singing the national anthem, according to CNN's Sean O'Key. People who already were in the camp joined in the singing as the officers passed by. [Updated at 10:44 p.m. ET, 11:44 p.m. Chile time] A fourth rescue worker has been lifted to the surface. Just two more rescuers remain in the miners' refuge about 23,000 feet below the surface. The last of the 33 trapped miners was taken to the surface nearly two hours ago. [Updated at 10:23 p.m. ET, 11:23 p.m. Chile time] A third rescue worker is back on the surface. Three rescue workers yet to be lifted back up. [Updated at 10:21 p.m. ET, 11:21 p.m. Chile time] We told you about the conversation that Luis Urzua, the last of the 33 miners to be rescued, had with Chilean President Sebastian Pinera shortly after Urzua was lifted to the surface. Here's video of part of that conversation, in which Urzua thanks Pinera and all of Chile and says he hopes this type of mining incident never happens again. [Updated at 10:10 p.m. ET, 11:10 p.m. Chile time] A third rescue worker is being lifted to the surface. Of the six rescuers who were lowered into the miners' refuge to facilitate the rescue operation's final phase since last night, only three remain underground. [Updated at 9:58 p.m. ET, 10:58 p.m. Chile time] CNN's Sean O'Key sends this report from “Camp Hope,” the area near the rescue site where miners’ relatives had held vigil during much of the miners’ 69-day isolation: Shortly after the last miner was rescued, balloons with the Chilean flag were released, and family members that have remained in “Camp Hope” swarmed the overlooking hill where tributes and flags had been planted, singing the national anthem. [Updated at 9:53 p.m. ET, 10:53 p.m. Chile time] The second of six rescue workers who had been lowered to the miners' underground refuge during the rescue operation has been lifted to the surface. Chile's mining minister is congratulating the rescuer, and the capsule is going back down to the refuge to pick another one up. [Updated at 9:42 p.m. ET, 10:42 p.m. Chile time] One of the six rescuers who were sent down to the miners' refuge over the last 24 hours already is back to the surface, and the rescue capsule has picked a second up. Four rescuers remain in the underground refuge. [Updated at 9:33 p.m. ET, 10:33 p.m. Chile time] More from the speech of Chilean President Sebastian Pinera: He praised the miners' families, saying they had faith that moved mountains. He also heaped praise on the rescuers, saying they gave themselves completely to the task. He said the successful rescues were a true blessing from God. He also noted that this event is one that has helped make this a remarkable year for Chile, which suffered a strong earthquake in February and is celebrating its bicentennial. "I think Chile is more unified and stronger than ever and more respected and valued in the world," he said, according to a translation from Spanish to English. "I want to say we did it the Chilean way - this means that we did it right, with unity, faith, hope, and I would like to thank everybody." He said the 33 miners showed loyalty and teamwork. And he said that he told Luis Urzua - the last of the 33 miners to be rescued, and the leader and shift foreman of the group - that he was a boss "that made us proud." [Updated at 9:20 p.m. ET, 10:20 p.m. Chile time] Officials have wasted no time to start bringing up the six rescuers who were in the refuge. The capsule carrying one of the rescue workers is being lifted now. [Updated at 9:16 p.m. 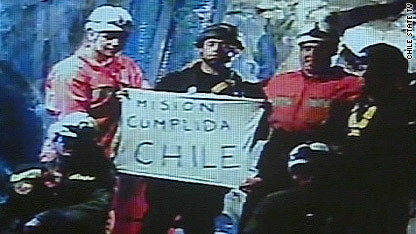 ET, 10:16 p.m. Chile time] The six rescuers who were sent down to the miners’ refuge 23,000 feet below the surface to help the miners leave are holding up a sign that translates to "Mission Accomplished Chile," video coming from the refuge shows. Rescuers still need to pull those six up to the surface. [Updated at 9:11 p.m. ET, 10:11 p.m. Chile time] Luis Urzua - the last of the 33 miners to be rescued - apparently is recounting to the president the first few hours of the collapse. Now they're sharing another hug and handshake, and the conversation - several minutes long - ends. [Updated at 9:09 p.m. ET, 10:09 p.m. Chile time] Urzua and Chilean President Sebastian Pinera are having an extended conversation now as rescuers and others look on. Some still are hugging each other, others are talking on cell phones. [Updated at 9:07 p.m. 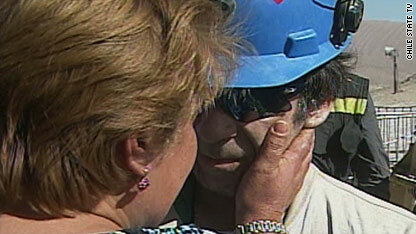 ET, 10:07 p.m. Chile time] Chile's mining minister also congratulated Urzua, the last of the 33 miners to be rescued. Like he said to the president, Urzua responded that he hoped this would never happen again. [Updated at 9:05 p.m. ET, 10:05 p.m. Chile time] More on what the president told Urzua before the singing began: He congratulated him, saying Urzua fulfilled his duties, and that he was proud of all the miners. Urzua responded to the president's praise: "As I said before, I pray this will never happen again," he said, according to a translation from Spanish to English. "Thank you to all the rescuers and everyone who came here." [Updated at 9:02 p.m. ET, 10:02 p.m. Chile time] Singing now from the rescue site, led by the president. [Updated at 9 p.m. 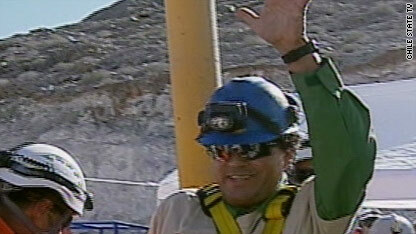 ET, 10 p.m. Chile time] Chilean President Sebastian Pinera praises Luis Urzua - the last miner to be rescued. “You have been a very good boss and leader of this group." Urzua was the shift supervisor and is credited with making decisions that saved the group in the first days after the collapse and kept the group together. [Updated at 8:58 p.m. 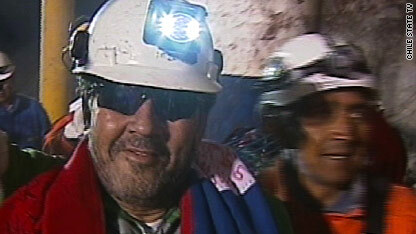 ET, 9:58 p.m. Chile time] Luis Urzua - the last miner to be rescued - is out of the capsule. He's being embraced by all sorts of people, including a relative. [Updated at 8:55 p.m. ET, 9:55 p.m. Chile time] The capsule carrying Luis Urzua - the 33rd and last miner to be rescued - is back on the surface. The 69-day effort to find and get the miners out of the collapsed mine is over. [Updated at 8:54 p.m. ET, 9:54 p.m. Chile time] The capsule is about to emerge - the rescuers can shout to him. Asked how he is, Luis Urzua answered, "Good." [Updated at 8:51 p.m. ET, 9:51 p.m. Chile time] Chilean President Sebastian Pinera and Chile's first lady are hugging rescuers as they wait for Luis Urzua - the last of the 33 miners to be rescued and the group's leader - to appear. [Updated at 8:48 p.m. ET, 9:49 p.m. Chile time] On the surface, rescuers are singing and clapping as they wait for the capsule carrying Urzua to appear. Just a few minutes left. [Updated at 8:47 p.m. ET, 9:47 p.m. Chile time] Urzua is on his way. We expect to see him come to the surface in about eight minutes. Meanwhile, the rescuers in the miners' refuge 23,000 feet below the surface are hugging each other. Their job is about done - and they'll be lifted out after Urzua. [Updated at 8:46 p.m. ET, 9:46 p.m. Chile time] The capsule carrying Luis Urzua - the last of the 33 miners to be rescued - is now being lifted. The rescuers underground are cheering and clapping. [Updated at 8:44 p.m. ET, 9:44 p.m. Chile time] Urzua is aboard the capsule, and he’s getting final instructions from the rescuers who are with him in the refuge. [Updated at 8:43 p.m. ET, 9:43 p.m. Chile time] As shift foreman, Urzua assumed command and control of the underground world that he and 32 fellow miners lived in since the collapse. His instructions to his men in the hours after the collapse – among them, to ration the little food and liquid that they had in a small refuge – are credited with keeping the group alive during the 17 days it took for rescuers to locate them with a probe and start sending them supplies. [Updated at 8:41 p.m. ET, 9:41 p.m. Chile time] The capsule is in the refuge 23,000 feet below the surface now, and Urzua is about to enter. Just minutes more for him now. [Updated at 8:40 p.m. ET, 9:40 p.m. Chile time] Now we’re awaiting the rescue of the last miner remaining in the refuge - Luis Urzua, 54, the shift supervisor who held the 32 other men together. [Updated at 8:37 p.m. ET, 9:37 p.m. Chile time] CNN's Karl Penhaul reports that the day before the mine collapse, Ticona - the 32nd rescued miner who appeared on the surface moments ago - and his wife had just settled on a name for his soon-to-be born daughter the day before the mine collapse. The baby was born 40 days after the collapse, and the couple changed the name to Esperanza (Hope). 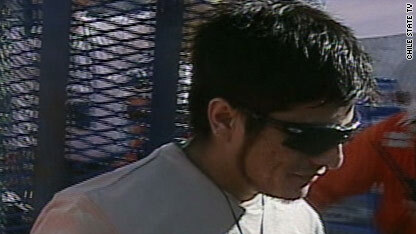 Ariel Ticona greets his wife upon leaving the rescue capsule. [Updated at 8:34 p.m. ET, 9:34 p.m. Chile time] Ticona, the 32nd rescued miner - after embracing his wife - showed everyone the phone that he says the miners used to first establish contact with rescuers on the ground. Smiling and chewing gum, Ticona also embraced Chile's president and the first lady. [Updated at 8:28 p.m. ET, 9:28 p.m. Chile time] The trip took only nine minutes. The capsule carrying the 32nd rescued miner, Ariel Ticona, 29, has come to the surface. [Updated at 8:19 p.m. ET, 9:19 p.m. Chile time] The capsule carrying the 32nd miner, Ariel Ticona, 29, is on its way up. On the 40th day of the miners' isolation, Ticona's wife gave birth to a baby girl, named Esperanza (Spanish for hope) - and he was able to witness the birth by video. Ticona has three children, but Esperanza's birth was the first he witnessed. [Updated at 8:16 p.m. ET, 9:16 p.m. Chile time] The rescue capsule is back down in the miners' refuge, ready to take up the 32nd miner, Ariel Ticona. Pedro Cortez's daughter waits anxiously for him. [Updated at 7:59 p.m. 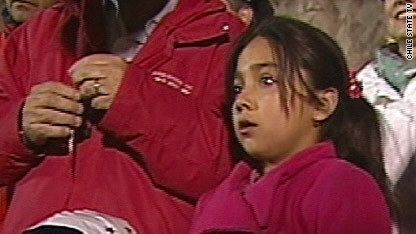 ET, 8:59 p.m. Chile time] Like other young girls witnessing their father's homecoming, ﻿the daughter of Pedro Cortez starts crying before her father reaches the surface, making him the 31st rescued miner. The young girl has brought balloons of the Chilean flag and that she distributes among the crowd. As her father takes her up in his arms, members of the crowd release them into the night sky. Cortez, a 25-year-old acoustics expert, began working in the mine with childhood friend, Carlos Bugueno, who was released earlier today. The day the mine collapsed was Raul Busto's first day inside. [Updated at 7:36 p.m. 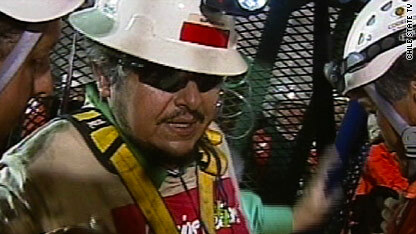 ET, 8:36 p.m. Chile time] Raul Busto reaches the surface, becoming the 30th miner to be rescued. two months and had never been inside until the day of the collapse, when he went down to repair a truck. The 40-year-old hydraulics engineer was tasked with overseeing the water supply during his two months of captivity. [Updated at 7:21 p.m. ET, 8:21 p.m. Chile time] Raul Busto's journey to the surface begins just like everyone else's before him - with photographs of him suiting up. In fact, nearly every step of the 2,000-foot ascent is documented. A video camera in the room where the rescue capsule picks up the miners shows their activity before they leave. A camera rigged up to the hard hats worn by the miners captures their journey through the shaft. And once they step out of the shaft, the cameras are still rolling. Juan Carlos Aguilar was a shift supervisor in the mine. [Updated at 7:13 p.m. ET, 8:13 p.m. Chile time] The last traces of daylight had fallen behind the mountains as the 29th miner stepped out of the rescue capsule. ﻿Juan Carlos Aguilar, 49, served as a supervisor for one of three work shifts in the mine. A father of two, he has been mining for 19 years. Richard Villarroel was greeted by his sister and mother. [Updated at 6:42 p.m. ET, 7:42 p.m. ET] The 11-year-old sister of Richard Villaroel was fighting back tears even before her older brother emerged from the shaft. When the rescue capsule finally appeared, the little girl burst into a combination of tears and laughter. Waving a flag that read "Gracias Chile," the little girl led the group in the chant that has been sung to each rescued miner: "CHI-CHI-CHI, EL-EL-E, LOS MINEROS DE CHILE!" Nor could Villaroel's mother contain her sobs as she hugged him with a flag wrapped around them. Villarroel, 27, never told his mother that he was working at a mine. His girlfriend is expecting a child in November. [Updated at 6:17 p.m. ET, 7:17 p.m. Chile time] Confetti and streamers fly at the Lobos family tent as Franklin Lobos becomes the 27th to emerge from the rescue shaft. The daughter of the ﻿former Chilean national soccer star-turned-miner greets him with a signed soccer ball and a tearful hug. "You have won the toughest match of your life," Chilean President Sebastian Pinera tells the 53-year-old as he makes his way through the line of dignitaries. "The hardest match of my life," responds Lobo, who earned the nickname "magic mortar" as a soccer player for his kicks. ﻿The mine collapsed as he and Jorge Hernan Galleguillos Orellana drove a truck deep inside the shafts. They slowed down to look at a small white butterfly that had somehow gotten in the mine, and just ahead of them the rocks began caving in. They credit the butterfly with saving their lives. [Updated at 6:08 p.m. ET, 7:08 p.m. Chile time] The family of former Chilean national soccer player Franklin Lobos cheers as the rescue capsule carrying him leaves the mine. Members of Lobos' extended family have been a constant presence at the San Jose mine site, inviting members of the media to work in their tent and dine with them, CNN's Patrick Oppman said. Claudio Acuna has worked in the mines for 20 years. [Updated at 5:55 p.m. ET, 6:55 p.m. Chile time]﻿ Claudio Acuña's fiancee and crying 2-year-old daughter greet him after he emerges from the capsule, making him the 27th rescued miner. The little girl screams for her grandmother, who is nearby, as the couple takes her in their embrace. The 34-year-old celebrated his birthday in the mine and became engaged to his girlfriend, Fabiola Araya, while he was trapped in the mine. ﻿[Updated at 5:39 p.m. ET, 6:39 p.m. Chile time]﻿ Miner number 26, Claudio Acuña, begins his ascent to Camp Hope. Renan Avalos was trapped with his brother, who was the first miner to be rescued. [Updated at 5:29 p.m. ET, 6:39 p.m. Chile time] Nearly 19 hours since his brother became the first rescued miner, Renan Avalos emerged from rescue capsule and fell into the arms of his wife. The two embrace for a good long time, and can't seem to pull away from each other. They do for a moment, and then return to each other. Avalos, 29, and his brother, Florencio Avalos, joined the mine four months ago after leaving the grape industry. ﻿[Updated at 5:08 p.m. ET, 6:08 p.m. Chile time] Below ground, the five-member rescue team poses for pictures with the Chilean flag. They went down into the mine yesterday evening. A sixth crew member is expected to relieve them. ﻿[Updated at 4:58 p.m. ET, 5:58 p.m. Chile time]﻿ Before the capsule carrying José Henriquez, the 24th rescued miner, emerges from the shaft, a crew member calls out, "Do you hear me?" His muffled response, "Yes, I hear you," elicits claps and cheers. He climbs out, fists pumping, as his wife rushes towards him and starts to sob as they embrace. years working in them. Before the explosion, Henriquez warned that something was wrong with the mine. During the period of captivity, he served as a spiritual leader for the trapped miners. He also spoke highly of the rescue capsule and the shaft, noting that the miners were coming out dry and with very little dust on them. "Things are going fantastically well, better than expected," he said in a press conference. "The work at the shaft has been really impeccable." [Updated 4:32 p.m. 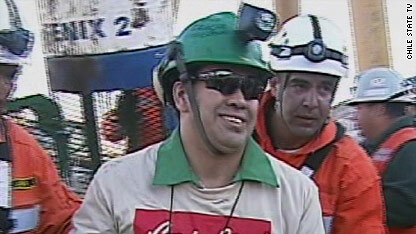 ET, 5:30 p.m. Chile time] Carlos Bugueño, 27, reaches the surface, making him the 23rd miner to be rescued. Bugueño helped oversee the packages coming into and leaving the mine during his captivity. 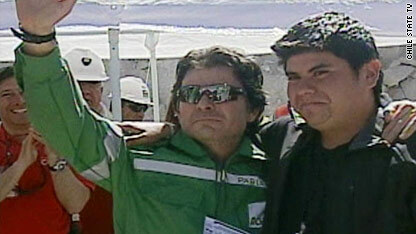 He joined the mines with childhood friend Pedro Cortez, who is expected to be the 31st miner to reach the surface. ﻿﻿﻿[Updated 4:30 p.m. ET, 5:﻿30 p.m. Chile time] Miner Dario Segovia, the 20th miner to reach the surface, leaves the triage center and enters the family greeting area. He's traded in his outfit of dusty T-shirt, and green utility pants for what appears to be a teal jumpsuit. But he's still wearing the dark sunglasses to help his sight adjust to daylight as he hugs his relatives. Samuel Ávalos monitored gas levels underground while the group was trapped. ﻿﻿[Updated 4:05 p.m. ET, 5:05 p.m. Chile time] Samuel Ávalos reaches the surface dressed in the same outfit as his predecessors: dark sunglasses, blue hard hat, beige shirt that reads, "Gracias Senor," or "Thanks be to God," over what appears to be a green jumpsuit. His wife greets him with a hug and the two share a long kiss that elicits claps and whistles from those surrounding them. [Updated 3:55 p.m. 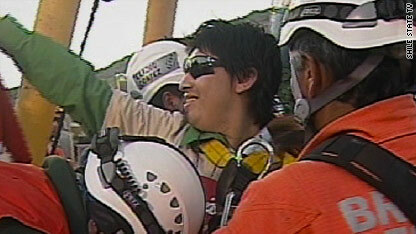 ET, 4:55 p.m. Chile time] Samuel Avalos has left the mine in the rescue capsule, bound for Camp Hope. Yonni Barrios was nicknamed "Dr. House" for assuming the role of paramedic. [Updated at 3:34 p.m. ET, 4:34 p.m. Chile time]﻿ Yonni Barrios becomes the 21st miner to be brought to the surface. Barrios, 50, assumed the role of chief paramedic for the group due to his previous nursing experience. As a child, Barrios was tasked with caring for his diabetic mother. Fellow miners are calling him "Dr. House" after the American TV show, which is popular in Chile. He has been working at the mine since 1985 and is married with no children. [Updated at 3:21 p.m. ET, 4:21 p.m. Chile time]﻿ Yonni Barrios, the 21st miner, begins his ascent to Camp Hope. Dario Segovia's father was also trapped in a mine. [Updated at 3:01 p.m. ET, 4:01 p.m. Chile time]﻿ Dario Segovia reaches the surface, making him the 20th rescued miner since efforts got under way Tuesday night. Segovia, 48, is the second generation of his family to be trapped in a mine. His father, who spent a week trapped in a mine, began taking him down in the mines when Rojas was 8. His wife snaps a picture of him while he is still strapped into the rescue capsule, a red, white and blue cylinder bearing the Chilean flag and its colors. After he exits, he touches the ground and the rescue crew cheers. After Chilean Mining Minister Laurence Golborne and other officials greet him with hugs, he is loaded onto a stretcher, covered with a blanket and brought to the triage center for medical assessment. In the waiting room, cameras capture the jubilant scene as Golborne greets the miners' relatives in a surreal moment that plays out instantly on the television screen behind them. ﻿[Updated at 2:47 p.m. ET, 3:47 p.m. Chile time] Miner Dario Segovia begins his ascent to Camp Hope. Meanwhile, rescued miner Edison Pena has found out that he has a special invitation to visit Elvis Presley's home in Memphis, Tennessee. Pena, a die-hard Elvis fan, led his fellow trapped miners in Elvis sing-alongs to pass time while waiting for their rescue. Read the full story on CNN.com. [Updated at 2:30 p.m. ET, 3:30 p.m. Chile time] The rescue capsule is sent back down the mine, where 48-year-old Dario Segovia is expected to be the miner brought to the surface. Miner Pablo Rojas is greeted by son, Michael, after more than two months in the mine. [Updated at 2:28 p.m. ET, 3:28 p.m. Chile time] The 19th miner, Pablo Rojas, reaches the surface, where he is greeted by his son, Michael Rojas, in a long embrace. Rojas, 45, was trapped in the mine with his two cousins, Victor Segovia and Esteban Rojas, who have already reached the surface. [Updated at 2:15 p.m. ET, 3:15 p.m. Chile time] Pablo Rojas begins his ascent to Camp Hope. [Updated at 2:00 p.m. ET, 3:00 p.m. Chile time] President Obama praises the rescue workers and the Chilean government for their efforts so far, saying the story has "inspired the world." Obama said the world watched the rescue of the first miner and his embrace of his family upon reaching the surface. "The tears they shed after so much time apart expressed not only their own relief, not only their own joy, but the joy of people everywhere," he said. The president also commended help from the United States and elsewhere in the rescue effort, citing the NASA team that he said designed the rescue vessel and other U.S. support. [Updated at 1:57 p.m. ET, 2:57 p.m. Chile time] The rescue capsule has been sent back down to the mine. 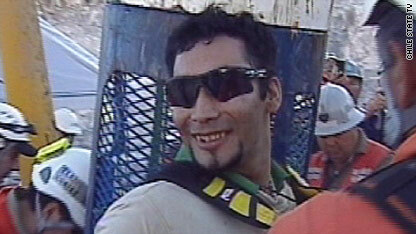 The next miner expected to be brought to the surface is 45-year-old Pablo Rojas, cousin of Estebean Rojas. 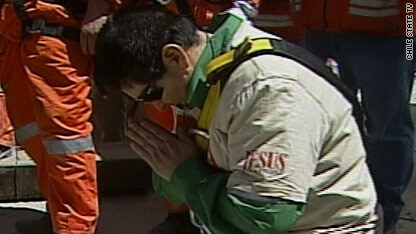 Esteban Rojas prays after being rescued from the mine in Chile. [Updated at 1:49 p.m. ET, 2:49 p.m. Chile time] Esteban Rojas has been lifted out of the Chilean mine where he has been trapped for more than two months. "Esteban, how are you?" the rescuers shouted as he got close to the surface. You could hear him shout through the chamber showing he was okay: "Bien!" His wife Jessica Yanez grasped onto a religious tapestry with Mary on it as she awaited to see her husband - the 18th man to be lifted from underground. As soon as he exited the capsule Rojas too knelt down on the ground, clasped his hands in prayer and lifted his hands to the sky to praise God. His wife then wrapped the tapestry around him as they hugged and cried as workers rallied in a Chile chant. Rojas, 44, was working with supplies sent down to the mine. During his time in the mine he asked his wife of 25 years to renew their vows - and they plan to do so shortly after his rescue at a traditional church this time. [Updated at 1:27 p.m. ET, 2:27 p.m. Chile time] Esteban Rojas is being put into the rescue capsule and will soon begin his journey to the top of the mine and see his family at Camp Hope. [Updated at 1:23 p.m. ET, 2:23 p.m. Chile time] Crews worked to rescue 33 trapped miners as if the miners were their children, a posting on the official Twitter page of Chilean President Sebastian Pinera said Wednesday. "We looked for them like our children. We found them with God's help. We are rescuing them as Chileans," the posting said. "May their example inspire us." The posting also thanked several heads of state, including the leaders of Brazil, Ecuador and the United Kingdom. See details of the first half of the Chile mine rescues by following our minute-by-minute updates here. [Updated 4:05 p.m. ET, 5:05 p.m. Chile time] Samuel Ávalos reaches the surface dressed in the same outfit as his predecessors: dark sunglasses, blue hard hat, beige t-shirt that reads, "Gracias Señor," or "Thanks be to God," atop the star from the Chilean flag. Congratulations to the Chileans. They showed the world they can deliver under immense pressure. This rescue operation is like the rescue operation of the Apollo 13. It also shows that you don't have to be a superpower to be good at what you do. Compare this extremely well planned and executed rescue operation to the fiasco of the BP oil leak in the US. In one case you have a well disciplined team working in concert, in the other case you have a bunch of clueless people trying to assign blame, make unrealistic estimates and take the limelight. My 4yr old daughter and i sat there glued to the tv watching before she went to school at 6am and after she returned until the last person was out of the mine. As we sat there watching we both cheered as each miner came out of the mine clapping and chanting along with the chilean people. They have truly showed me and the world what a nation should look like.. They have so much love for god and each other. When I think about the world today it saddens me because of all the violence,crime, and war going on in this world but over the past 69 days I started to remember that even though there is all the bad all the good still over comes. I do believe god was with all 33 miners in that mine for 69 days and was watching over them this entire time. So many people question if god is real or not but today seeing all these miracles that has to show god is real, god is great, and god loves each and everyone of us. Best wishes to all the miners, rescuers, their families, and everyone who help bring these miners home alive. MAY GOD BLESS YOU ALL! President Pinera is so very right in critizing the shoddy mining operation, and placing human life first...before business. Only wish my country, America, would follow his example and place human beings ahead of corporate america. My words cannot express how happy I am that all 33 miners were rescued....My best wishes to them and their families. As for all you bloggers who are so negative, I just really feel so very sorry for you all....what, I wonder, happened in your life to make you so heartless? As President Obama said....this situation was certainly inspirational, cannot even imagine how one could not be touched by this situation. Oh, by the way, if something is not spelled correctly, or a comma misplaced...oh well....get over it. Wishing everyone a very happy day...count your blessings, and stop with the negativity...it is getting old. At least they didn't have to deal with bedbugs! Great success!!! As a minig specialist I can understand what is happened. The efforts done are an example for all the world and specialy for the minig community. Safety against profit! God knows his work, and we? Cordial greetings to the miners and their families! Very happy to see those miners BACK!!!!! I was overjoyed with tears when Manual Gonzalez was the first & last rescuer in the mine, prayed, bowed & waved to the camera before getting into the capsule...a wonderful way to end the mission.God Is Greatly To Be Praised! What a wonderful thing...........God is sooo Good. I Thanks him for their lifes. Glad to see the united world for the Chilean miners. My respect goes to the President Pinera. Wish all world leaders look like him!! Where you get your idea of God...from your bible? ...'god created the heavens and the earth in six(6) days and in the seventh(7th) day he rested'. god was tired and he needed to rest. Its a projection of human mind. People must be ashamed of themselves for believing these stories from more than 2000 years ago. Just about 500 years ago pple used to believe the earth was flat and not the sun but the earth was the center of the solar system. People must be delusional to believe that these scriptures are the word of god. I think the problem with religious pple is that they love themselves more than the love truth/facts that is why they can not be open minded. Well coordinated human effort saved those miners who where helpless in the belly of the earth. Nearly all credit goes to the people who did the saving. What would Jesus say to you now?